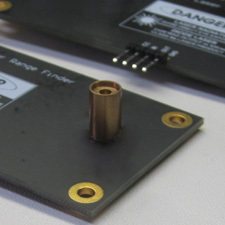 The Laser Range Finder (LRF) module is a low-cost instrument that uses laser light to measure the distance to a targeted object up to 8 feet away. The LRF incorporates a multicore Parallax Propeller microcontroller, OmniVision OVM7690 640×480 CMOS CameraCube, and Arima 635nm APC Laser Diode. Distance to a targeted object is calculated by optical triangulation using trigonometry between the centroid of laser light, camera, and object. Applications include distance or liquid level measurements, object detection and/or avoidance, and item counting. 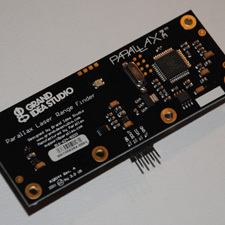 Parallax, Inc. was the exclusive manufacturer of the LRF. The module has been discontinued as of September 17, 2018. This design is distributed under a Creative Commons Attribution 3.0 United States license.